Disclaimer: I received this ARC for review through a Goodreads giveaway. I found the dystopian YA read Beware the Night to be a slow burn that took a while to get into. While the writing is excellent and the plot intriguing, after finishing the book I was left with the sense that it was nothing really new, same old same old, and therefore, predictable. Like many YA books at the moment, it's clearly going to be part of a series, which is getting tiring, there's a love triangle, and it all just see Disclaimer: I received this ARC for review through a Goodreads giveaway. Ok, to be fully transparent here, I didn't have super high hopes for this book. It sounded ok, but it also reminded me of dozens of other YA books I've read, most of which were poorly done and disappointing. It was an incredibly lovely surprise to be proven so wrong...I really enjoyed this book! Sure, the basic structure and foundation is similar to many others, but this book is full of interesting layers and dimensions that I don't usually find in YA like this, and it was really well done. The Ok, to be fully transparent here, I didn't have super high hopes for this book. It sounded ok, but it also reminded me of dozens of other YA books I've read, most of which were poorly done and disappointing. It was an incredibly lovely surprise to be proven so wrong...I really enjoyed this book! Sure, the basic structure and foundation is similar to many others, but this book is full of interesting layers and dimensions that I don't usually find in YA like this, and it was really well done. The story is layered, the pacing is good, the reveals all felt natural and make sense, and even the love triangle is decent (I swear that's not a spoiler...it's super obvious from chapter two). Ok, the love triangle is fairly tedious, but I despise that trop and I didn't despise it here, so that's saying something. I also really liked the MC, Veda. She's flawed, and she makes some rash decisions, but she learns from her mistakes and she does think before she acts most of the time. She's strong and also vulnerable, and I enjoyed her character arc. I actually liked all of the characters, and I think they are fully formed and well done. I especially like that each characters has a clear motivation that makes sense for the character and the greater context of the story. I was a tad cocky at the beginning, and I thought I had the whole thing figured out, but I was (delightfully) proven wrong several times. All of the twists made sense, and they never felt like they were strictly for shock value. I could have done with it being a tad darker, especially given the nature of the story, but I always feel that way, and I think most readers won't mind the tone. My only real complaint is that at I had no idea this book isn't a standalone. I combed goodreads and I didn't find any indication anywhere that it would have a sequel, so be warned that you aren't going to get the answers you want at the end. The way it ended was a perfect set up for the next book--it gave enough to feel finished, but still left me wanting more--and I will be devouring the next book when it comes out...but it was a tad obnoxious to keep waiting for answers or a finale that wasn't going to happen. I won this ARC through a Goodreads Giveaway! This was a fun read! I loved Fleck’s writing style. It flowed nicely, and her ability to write tension really kept me on the edge on my seat throughout this book. The concept of this story is unique, as it is set on an island where people worship the sun in exchange for protection against the night. It is a quick, fun, enjoyable read. However, I feel like the plot of this story is one I have read many times before. It is really similar to Shatter Me, th I won this ARC through a Goodreads Giveaway! However, I feel like the plot of this story is one I have read many times before. It is really similar to Shatter Me, the Grisha Trilogy, and other popular YA series. It also features some of my least favorite tropes, such as a love triangle and a main female character who, despite having no qualifications, is chosen to lead a rebellion. Despite some of this issue I had with this book, I still think this is a quick, fun read. I would recommend this to anyone who is in need of an exciting book to get them out of a slump. 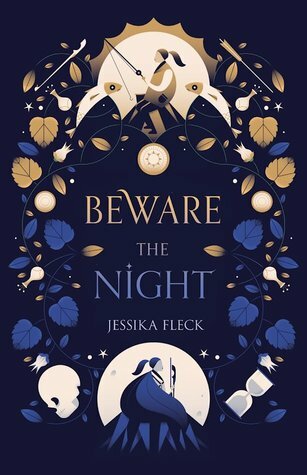 Thank you to the author, Jessika Fleck for sharing a review copy of BEWARE THE NIGHT. This YA story follows Veda, a young girl who has grown up fearful of the Night, a rogue group who is said to have been kidnapping and torturing the sun-worshiping citizens of Bellona for years, though only the lower class citizens, the Basso, seem to be affected. The Dogio, who make up the superior class as well as the Imperi army caution Bellonian citizens against the night and sacrifice one Basso citizen a ye Thank you to the author, Jessika Fleck for sharing a review copy of BEWARE THE NIGHT. This YA story follows Veda, a young girl who has grown up fearful of the Night, a rogue group who is said to have been kidnapping and torturing the sun-worshiping citizens of Bellona for years, though only the lower class citizens, the Basso, seem to be affected. The Dogio, who make up the superior class as well as the Imperi army caution Bellonian citizens against the night and sacrifice one Basso citizen a year to appease the sun gods. Veda, who is Basso has always questioned the imbalance of power and standards of living, especially since her best friend and love interest, Nico, is Dogio. When Veda starts to learn more about the Night, will she be able to sustain her friendship with Nico? eARC provided by publisher through NetGalley. All opinions are my own. On an island called Bellona, the night is something to fear. The Sun is to be worshipped and with sacrificial offerings, it will protect them from any harm. Veda’s world gets thrown upside down when her grandfather becomes an offering. A young man has the answers she is looking and she must decide if what she has been told her whole life is a lie. I was hoping since this book had a beautiful cover and an interesting synopsis th eARC provided by publisher through NetGalley. All opinions are my own. I was hoping since this book had a beautiful cover and an interesting synopsis that it wouldn’t disappoint and thankfully it didn’t! The main character of this book, Veda, is a young girl that is easy to connect with. She comes from a troubled background of losing her parents and growing up in her grandfather’s house. They live in a society of sacrificial offerings and through all of this she remains strong. The other characters, Dorian and Nico, are also interesting characters and add to the issues that Veda faces. At times it felt like there was going to be a love triangle but one never emerges so I am happy about that. My one complaint when it comes to the characters is that in some ways they felt a bit flat but it didn’t take away from the plot so it wasn’t a huge deal breaker for me. Usually I am not one that enjoys first person point of views but I really liked the author’s writing style and it kept me interested the whole way through. I read it in one sitting so that says a lot! The plot twists were ones I weren’t expecting and made for a great fast pace read! Although the world building was a little bland I still fell into the world and it didn’t take away from the overall plot. Note: I started skim-reading at the 24% mark. - The beginning was dull and slow, events became marginally interesting at around the 21 to 24% mark, only to quickly regress into an unenjoyable mess. - This is definitely NOT a quickly paced fantasy adventure. - From the synopsis, the mythology sounded fascinating, but throughout the story itself, I remained skeptical of its believability. I just could not imagine people having faith in these stories, much less willingly losing their lives for the fulfillment of a half-baked prophecy (as spoken of by these stories). - The world-building as a whole was one of the weakest points of Beware the Night, which is primarily why the story fell apart for me. In fact, I won't go into details, but I spotted a few gaping plot holes. - ALSO, CAN WE TALK ABOUT HOW SHE WENT FROM KISSING ONE GUY TO KISSING ANOTHER GUY WITHIN - WHAT - 3 TO 5 CHAPTERS??? And that she kept going back and forth between the two of them, instead of focusing on the larger picture??? The love triangle was just unnecessary. - The characters generally fell flat and felt underdeveloped, but nonetheless, I did develop a liking towards both the love interests: Nico and Dorian. If it were up to me, I'd throw Veda into the sea and make it my mission for these boys to fall in love with each other. - The "plot twists" were hastily explained and poorly executed, diminishing their impact. - The storytelling was really incohesive, and consistently throughout the story, I had a difficult time believing what was happening. Everything just seemed... dumb to me. And not well thought of. - I wouldn't recommend this to anyone. Ever. And I definitely won't stick around for the sequel. Disclosure: I received a digital copy of Beware the Night from the publisher (via NetGalley) in exchange for an honest review. Haha, if you read the book you might get the ^^ reference. But in all honesty I really enjoyed this book. I liked the characters, although some had their flaws, it also made them more realistic. As in not knowing what the right thing to do in a situation, I pick one way, they pick another, hey it is what it is. Also the world description was a little hard to follow (I got lost a few times when describing the underground) which also maybe added a bit because V got lost multiple times. Also kinda gave a Romeo and Juliet feel. Jessika Fleck - Jessika Fleck is an author, unapologetic coffee drinker, and knitter she sincerely hopes to one day discover a way to do all three at once. Until then, she continues collecting vintage typewriters and hourglasses, dreaming of an Ireland getaway, and convincing her husband they NEED more kittens. Her YA debut, THE CASTAWAYS (Entangled TEEN), is now available. Her next YA novel, BEWARE THE NIGHT (Swoon Reads/Macmillan) releases March 12, 2019. More at www.jessikafleck.com.